Delight. A pinwheel is all about delight. It’s defined by action-words like twirling, spinning, whirling, swirling, dancing. It’s associated with favorite things like fireworks, holidays, toys, cookies and even pinwheel-shaped galaxies. 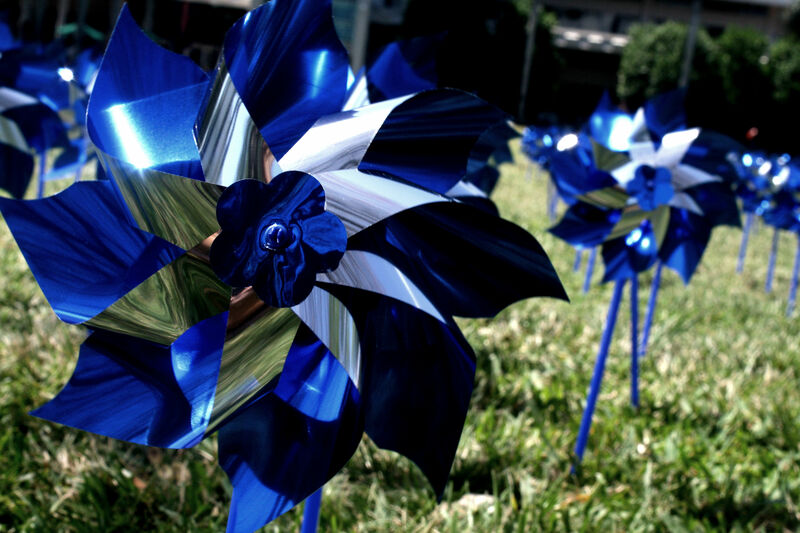 Pinwheels really are a fitting image to promote Child Abuse Prevention event such as those our fellow Founder of the Healing Voices, Mike Hoffman, helps organize. Pinwheels bring delight to hearts of adults and children alike. That freedom to feel happiness without anxiety or fear is exactly what is being preserved, among children now, by the extra efforts and resources devoted by any responsible diocese in the Church to protecting them. Pinwheels, these givers of spontaneous joy, reflect each protected child, living free of abuse, laughing and dancing in wind with delight. Twirling. Unencumbered by shame and broken trust. Pinwheels, less explicitly, are reminders of what was lost to adult survivors who, like Mike, are nevertheless willing to return the wounds of their childhood as an offering of service. They are willing to become vulnerable even now, to be living reminders of the critical importance of child protection programs in our Church and in our world. It’s tempting now to make a plea for the damaged pinwheel, with less or no spontaneity, with fears and anxieties and grief. Yes, it is true the busted vane of a pinwheel can reflect light. True that a broken stick can hold a spinning wheel. But the Good News is greater than that. The Good News is greater than making lemons out of lemonade. The Healing Voices is a greater an endeavor than settling an Island of Misfit Toys. And, organizing annual pinwheel events is more than a chore or window-dressing. There are no consolation prizes when it comes to child protection. Yet, still, there is ambivalence. There is resistance. So, here we are, together, remembering, not because it feels great but because the same Spirit which inspires delight through pinwheels also loves us all, broken however we may be, broken at whatever age by whatever burden or fault. We serve a Spirit Who delights in making the broken whole. This is no simple healing. It requires a practiced focus on the Lord. For survivors, this is a life-and-death leap of faith. This is not poetry. This is not allegory. This is not symbolism. This reality saves. Awe-struck in the shadow of the Cross. Dancing with the Son of Resurrection. None of us are limited by the fallen nature of the world and how its evil left us wounded from youth. Ask any survivor of abuse who leans on the Lord. We will tell you. We are living Truth. We surely wish for all children such a focused faith as they grow into adulthood. Yet, while we often disagree on method and approach, we survivors typically agree on one thing in particular. We want to spare children any need to turn to the Lord for this kind of healing, for this type of completion which we need daily and which we daily struggle to accept and believe in. May many pinwheels cover many lawns as people come together to reinforce the absolute importance of protecting children from predators in and beyond the Church, in schools, in civic groups, online. It is one way the Good News is something preached by Mike and other survivors simply by showing up as wounded healers, testifying for what is true, revealing the radical possibilities of God’s healing powers. For the full issue in which this article appears, click here.